S625PX Non-mercury replacement for PX625 or MR9. Silver oxide equivalent to LR09 PX625A D625 EPX625G V625U KA625 RPX625A V625U EPX625BP. Type: Silver Oxide. 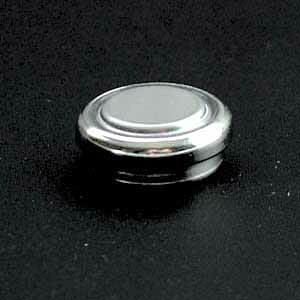 Voltage: 1.55 V.
Diameter: 15.25 mm. Height: 6.05 mm. Price: £6.20 each. £5.80 each if you buy two or more. Postage and packing included. Also known as: SR09 / PX625S / RPX625S / V625U / EPX625BP. 1.55 V Replacement for: PX625 / PX13 / EPX625 / V625PX / LR09 / PX625A / D625 / EPX625G / V625U / KA625 / RPX625A / V625U / HD1560 / EPX625BP. The S625PX is a replacement for the once popular Mercuric Oxide MR9 and PX625 coin type cell that was commonly used in cameras and is now banned because of toxicity and environmental fears. It has a distinctive appearance with its 'stepped' concentric disks. These S625PX cells produce 1.55V which is different from the 1.35V produced by the original PX625 mercury cell. This doesn't normally cause a problem because today's films are very tolerant to under-exposure and because the under-exposure is compensated for during printing. (so you would have greater problems if you were using slides). Because the S625PX silver oxide cell produces a steady 1.55V, you are able to compensate for the higher voltage by a fixed number of stops or by adjusting the ASA setting. There may be as many as two f-stops underexposure by a camera that uses 1.55v instead of the original 1.35v, but the compensation you require is constant. An alternative PX625 replacement is the alkaline cell, the LR9 or V625U. They fit perfectly but, as with all alkaline cells the voltage is not stable, it drifts down from 1.5V towards 1.35V (the voltage of the original Mercury cell) and then lower still. As the voltage is not steady throughout the useful life of the cells, you must constantly adjust how you compensate. Another PX625 replacement is a zinc air battery. The WeinCELL MRB625 is a custom zinc/air battery designed to replace banned mercury batteries. WeinCELLs deliver the same 1.35 V voltage and stability of output as did the mercury PX625batteries so there is no need to adjust your exposure. The WeinCELL MRB625 batteries last much longer than hearing aid batteries, some times up to a year. To achieve this longer life, the MRB625 used a proprietary electrolyte and has only two small air holes, instead of the 7 larger holes found in standard hearing aid batteries.